Foshan Luonan Aluminium Co., Ltd.
LuoNan Aluminium Products Co., Ltd. is a leading aluminium extrusion products manufacturer in China. It has an area of 100,000 square meter plant, an capacity of processing 30,000 tons of aluminium extruded products per year, including mill finish, anodized, electrophoretic, powder coated, PVDF, Bright Dip. We have 2 powder plants, 3 casting smelters, 11 extrusion lines, 2 anodizing production lines,2 powder coating lines , 1 thermal barrier production lines, 1 intensive machining lines, testing center and wasted water treatment center as well as many other quality testing equipments for all the extrusions. We have our own mould workshop which can produce more than hundreds sets of new moulds each month .These aluminium extrusions are mainly applied to windows, doors, curtain wall fixture ,transportation, architecture, thermal barriers, furnishings and commercial usage etc. Since the establishment of the company in 1985, we always believe in “the quality foremost", and are strictly in scientific management. After near 20 years of experiences on enterprise management and quality control, we have obtained several of quality certificates including ISO 9002:94 in 1996,and ISO9001-2000 in the year of 2002. Up to now, the products of LuoNan have been sale to different parts of China, Far East area, Southeast Asia as well as North America and Australia etc. 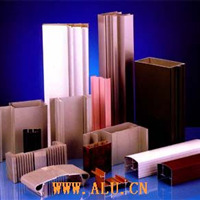 As the brand name of “LuoXiang”aluminium products, the truly service of us and excellent quality have been acknowledged by many customers from domestic and abroad. We believe that only be creative, keeping high level quality production, a competitive price and provide full catering service is the heart’s blood of an enterprise Our target is to be a world class aluminium extrusion supplier by manufacturing the first class product. We warmly welcome buyers from all over the world to enquire, to negotiable and cooperation on behalf for both sides.